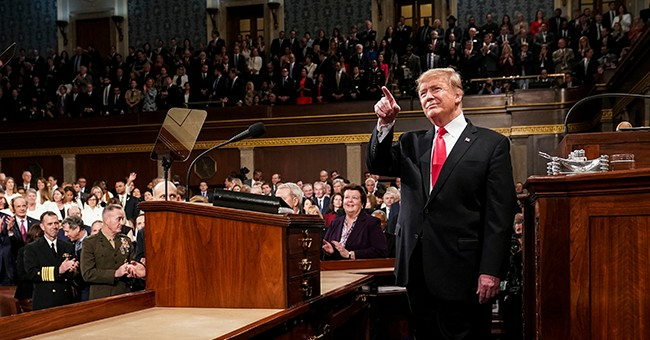 From fighting cancer and AIDS to fixing our broken immigration system, President Trump‘s State of the Union address was a unifying and inspiring roadmap for America’s future. However, I believe his most resounding success was invoking the memory of World War II and the Holocaust, which still has much to teach us in these trying times. Trump opened his over an hour long address with the upcoming 75th anniversary of D-Day. In the audience were two American veterans of the deadliest war in history. In a poignant loop, Trump closed his speech with the recent shooting at the Pittsburgh synagogue where I once prayed and the pervasive memory of the Holocaust. In the audience was officer Timothy Matson, who had been shot more than half a dozen times trying to rescue synagogue worshippers like Judah Samet. Judah, having survived the Holocaust, Israel’s war for independence, and now this shooting, had tears running down his face during the address. Side by side sat Joshua Kaufman, a concentration camp survivor, and Herman Zeitchik, an American veteran who had liberated that camp. 75 years after Herman had saved Joshua and his family, Joshua was now helping Herman into his seat. The connection between past and present in Trump’s address reminded the audience that history repeats itself, and we have much to learn from the world’s bloodiest decade. There is perhaps no greater example of the victory of freedom over tyranny than WWII. The last remaining free nations (and the USSR) united in arms against totalitarian dictators who had come to power by renouncing democracy. But more than democracy was at stake. As the Allies relieved cities and hamlets from German or Japanese control, like Dachau where Joshua had been interred, they soon realized the unspeakable cruelties of their enemies. There is perhaps no better metaphor for the American dream than Europe’s Jews. Displaced over centuries by religious and ethnic conflicts, my ancestors sought a land where they could be free to practice their religion, apply their skills to the betterment of mankind, and live how they see fit. It’s no wonder that America is today’s second largest home for the Jews. The Holocaust denied millions their lives and freedom. Even after my great-grandparents perished in the war, my family were denied freedom for another 45 years until the collapse of the USSR. Yes, WWII was an American victory, but it was also a triumph of freedom over oppression, good over evil. It was a reminder of how easily the ideas of hate and totalitarianism can take over a nation, and how difficult they are to weed out once they’ve taken hold. It is no coincidence that, in the same speech, Trump vowed “America will never be a socialist nation,” forcing Democrat leaders like Pelosi and Schumer to stand and applaud while Sanders and AOC sat grimacing. If Venezuela is not enough, perhaps the Nazi (aka National Socialist) party can help remind Americans of the dangers of socialism and big government. In invoking the memory of America’s triumph over evil, Trump helped to unify a bitterly divided nation by reminding us of what it means to be an American. He beseeched us to uphold freedom and resist ethnic and religious hate in all forms, lest we risk forgetting the past and repeating its tragic mistakes.